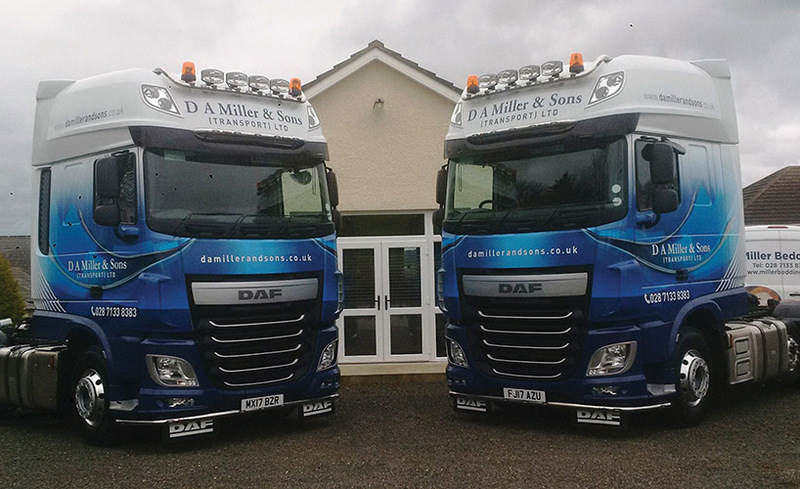 Recyclable material transport specialists DA Miller & Sons (Transport) Ltd recently took delivery of two new DAF XFs from TBF Thompson in Garvagh, doubling the overall fleet size in the past two years. The new additions will operate mainly between Northern Ireland and Britain where as much as 90 per cent of the company’s business is conducted. Not only do the new XF510s look the part with their beautiful bodywork, they also feature high-performance Paccar engines, generous Super Space cabs, lightweight chassis, ergonomic dashboards, robust components and fuel-saving technologies. They are part of an ongoing investment programme aimed at keeping DA Miller & Sons (Transport) Ltd ahead of the competition. “We are running almost all DAF with just one Mercedes in the fleet, which we also bought new last September,”director Ryan Miller explains. In addition, the Claudy, Co. Londonderry / Derry-based firm runs a dozen Knapen walking floor trailers as well as SDC and Rothdean steel tipping trailers and a Krone curtainsider with tail-lift which is used for transporting animal bedding. DA Miller & Sons (Transport) Ltd incorporates Miller Bedding which was formed in 2014 and offers a full range of quality bedding products to the farming sector, including bagged, baled and bulk sawdust. Wood pellet fines, which are a cheaper alternative to sawdust, are also available. The sawdust contains no MDF and is Red Tractor Assurance compliant. “We were working for a wood recycling company in the UK called Plevin when they asked us if we’d be interested in becoming Irish distributors for their Snowflake and Woodpecker brands. We have trucks coming back and forth every day so it made perfect sense,”Ryan says. Plevin is a family-owned company with a proven reputation for producing high-quality, sustainable products. It manufactures animal bedding, sawdust and wood shavings that are suitable for horses, agricultural livestock and small pets such as rabbits and guinea pigs. All of Plevin’s products are subject to rigorous quality and control checks, and are produced in a state-of-the-art dust extraction system. While Miller Bedding continues to grow, recyclable material transport remains the core business of the family enterprise, which is run by Drew (also known as David Andrew) and his sons Ryan and Glen. Initially starting with just one vehicle transporting municipal waste to landfill in 2004, the company has gone from strength to strength since it began specialising in large volume bulk haulage using walking floor trailers, which are ideal for the recycling industry, eight years ago. The dedicated recycling transport solutions provider operates large volume walking floor trailers which have a capacity of 110 metres (140 yrd3) with the ability to reach pay loads of up to 27 tonnes –even with lightweight material such as alloy wheels, farm plastic and dry mixed recyclables. As a result, DA Miller & Sons is more cost-effective than the competition, transporting more material per load and therefore reducing the cost per tonne of transport. Also, as the material is moved with fewer loads, it reduces the carbon footprint of the recycling process, making the firm one of the most environmentally-friendly transport providers in the industry. “Our large volume walking floor trailers provide 20 per cent more capacity than standard walking floor trailers and up to 50 per cent more than bulk tipping trailers. These are two big selling points for us,”Ryan continues. Recyclable materials handled include Waste Electrical and Electronic Equipment (WEEE), dry mixed recyclables, sheer aluminium, stainless steel, cooper, alloy wheels, waste tyre and tyre crumb, sawdust, woodchip, waste paper, farm plastic, CRT glass, waste plasterboard, green waste and municipal waste. Employing 10 highly-trained and professional drivers, DA Miller & Sons prides itself on the courteous and friendly service it offers, from enquiry to payment it aims to be as friendly and efficient as possible. It strives at all times to respond to quotation enquiries within 24 hours and be as flexible as possible to cater for the needs of its customers. Ryan says his family business will continue to evolve and has plans to open a second depot in Britain in the near future. “The industry is constantly changing and you have to be prepared to change with it or you’ll get left behind. We’ve always been flexible and recently we’ve gotten into waste brokerage where we provide recycling companies with outlets for further processing and recycling. We can also arrange the transport for them,”he explains. 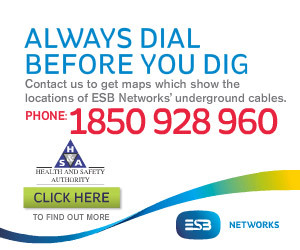 “Our plan is to keep growing and to continue providing an unrivalled service to our clients.